North Lanarkshire Council’s finance convener has urged residents to be aware of changes brought in by the Scottish Government to the top levels of council tax. The Scottish Government announced in November that there would be an increase in the amount people in bands E to H properties pay. As a result, householders of these more valuable houses will pay more from April this year. 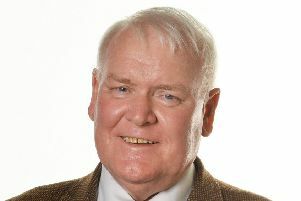 Councillor Bob Burrows, who chairs the finance and customer services committee, said: “The Scottish Government proposes to increase what is called the multiplier for properties in Bands E to H.
“Councils set Band D council tax and every other band is a percentage of that figure. The Scottish Government changes mean that a Band E household in North Lanarkshire will pay £104 more in council tax in the next financial year, rising to £509 for Band H households. “This has not been well publicised by the Scottish Government and so we need residents to understand the impact for them. In the Scottish Government’s draft budget, it is proposed that, on top of these multiplier changes, local authorities have the power to increase council tax by up to three per cent. Councillor Burrows added: “We have not yet decided what to do in terms of any council-agreed increase. “We do know that the majority of people in last year’s major budget consultation said they would be willing to pay more council tax to fund local services, but we still have work to do on our budget before we make any decisions.